Who’s Down and Who’s Out at the Winter Classic? Every year, fans and media hear the same line from players and management. That their struggles – their frustrations – can’t be blamed on their team’s injuries. But it seems this season injuries are at a surplus affecting teams more than ever. Stamkos is out. Luongo is out. Edler is out. But with all eyes on the Detroit Red Wings and the Toronto Maple Leafs heading into January, their injury woes have become the talk of hockey. With the Wings taking to the ice at Michigan Stadium on Tuesday for their afternoon practice, injuries – once again – were at the forefront. After taking a puck off the face, losing 10 teeth in the process, Cleary look rather irrelevant on Monday when the Wings took on the Nashville Predators. Now, Cleary’s never been a superstar of sorts, but even his physical play suffered in his the game against the Preds – a rather physical team themselves. The Wings will need Clearly to step up that physical part of his game if they hope to compete on Wednesday with the big Leaf defensemen. Alfredsson left practice early on Tuesday with started speculation that he was still dealing with back spasms. Alfredsson’s had a tough year in terms of battling injury this season finding himself in and out of the lineup every couple of weeks. Alfredsson felt better, team hoping he can play tomorrow, Holland said. He also said Glendening is playing for sure. The 41-year-old is listed as probable and hopes to play in Wednesday’s Winter Classic. However, if the spasms continue to nag the right-winger he’ll sit out what should be a great divisional game. 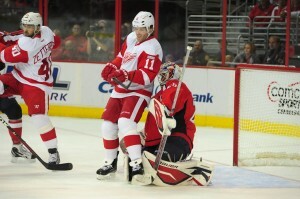 Now Henrik Zetterberg is back, but some of questioned how well he’s played. But coach Mike Babcock said Zetterberg is a player that can turn the tables of a game at any point. Jimmy Howard was back in the Wings’ lineup, but his performance on Monday in Nashville raised questions on his recovery and if he’s where he needs to be to compete. He’ll have to see the puck better on Wednesday to stop a Toronto offence that is beginning to gather steam once again. There is no question that Bolland had a great start to the season for the Toronto Maple Leafs. Off to what was arguably a career-year start offensively, a freak accident has sidelined the Leafs’ offseason acquisition. He’s most certainly out for Wednesday’s game and still remains out for another few weeks. Entering New Years day, it will be the big names – Kessel, van Riemsdyk, Bozak, Datsyuk, and Zetterberg – that will be relied on to make the difference. No matter who it is, it will definitely be a day to remember and it will definitely a ‘classic’ worth watching.